Post-modern, pop culture drivel! Intellectual inanity! Misguided creative energy! Random theatre for the attentively deficient! I am not sure how much I can temper my disdain for the latest faux-intellectual piece of garbage that is now wasting space on the stage of the Falls Theatre at ACT. Mr. Burns, a post-electric play is perhaps one of the worst plays I have ever had the displeasure of attending. Fifteen minutes into it and I was struggling to keep my eyes open for the rest of this bizarre three-act snooze fest. My problem is not with the production itself, (which is fine! ), but rather with the playwright who ever thought this was a good idea, with the editor for not stopping her from writing it, and with the artistic director who chose to include it in the company’s season. The script lost my interest from the get-go when characters, apparently survivors of nuclear disaster, spend the better part of the first act talking incessantly about an episode of the long-running, animated sitcom, The Simpsons. Having never been a major fan of the celebrated TV show, I found it hard to care about the characters or pay much attention to the dialogue. The mind-numbing experience intensified with an extended sequence in which the characters spent way too much time comparing their lists of names in search of lost loved ones. Thus, the whole first act consists of establishing the fact that the characters are in living in a post-apocalyptic world, and of them being inexplicably overly concerned with and distracted by the trivial events of popular TV show. One act down, and I still wasn’t feeling it! Act two starts with no intermission, and we are now 7 years further into the future. 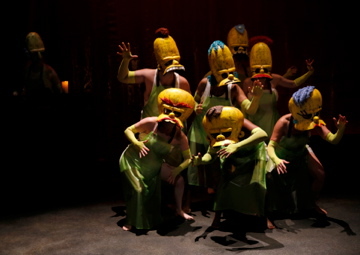 The cast of characters has taken their obsession to all new levels, having founded a theatre company specializing in productions of episodes from The Simpsons. In my struggle to remain awake, I somehow missed the supertitle that indicated we had now moved 7 years into the future, and so I was verily bewildered and confused by the time intermission finally rolled around none too soon! It was only after consulting with my companion for the evening that I even understood what took place in the second act. Although there was a part of me that didn’t even want to come back after intermission, I have to begrudgingly admit that the 3rd act was somewhat more interesting from a theatrical standpoint. Act Three transports us 75 years into the future. The survivors have now made a veritable religion of their performance ritual. The particular episode that consumed the minds of the characters in the first act has now been elevated to the level of a Brechtian style opera or epic musical in which the battle between good and evil plays itself out in a dystopian nuclear wasteland of blackened, poisonous waters and charred, barren earth. It is an interesting third act, but not interesting enough to make up for the boring and confusing first two acts, nor for the random premise on which the play is based. Obviously, there was great creative impulse on the playwright’s behalf, but one that needed more latitude and scope in its focus. For someone like myself, who has rarely ever even watched The Simpsons, it is really difficult to relate to this play. This said, I will congratulate the cast and crew for their artistic execution. Deb Trout’s costumes were as creative as they were fantastical. The scene design by Matthew Smucker was both functional and versatile. John Langs’ direction was inventive and effective. And the ensemble cast was strong and talented. Adam Standley was particularly entertaining in his role as Mr. Burns. In the end, however, I feel that the creative energy of these stage artists could have been better spent on a more universally engaging play, rather than one so obtuse and singular in its focus and structure. Mr. Burns, a post-electric play is now showing through November 15 at ACT, 700 Union St. For tickets and info, see www.acttheatre.org or call 206-292-7676.